Isabella is a merchant’s daughter and wife of Stephen Beauford. 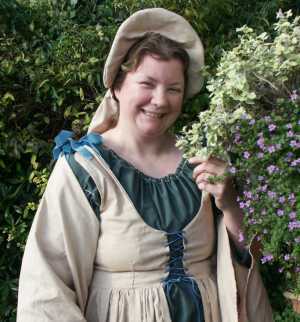 Living in the 1550s she tells the story of town life in Tudor times. Whilst she enjoys a wealthy lifestyle, Isabella is aware of life for poorer folk. Isabella is travelling between two of her homes, stopping at your school for a rest. She has a range of packages and parcels containing various everyday items and gifts for family and friends. Travel worn and hungry, she may break her fast and unwrap parcels to check and discuss their content. Don’t be surprised if she starts house-training the audience! There is no set script for the presentation, it depends on what artefacts or subjects the audience become interested. However, the material can be steered in the direction(s) desired by class teacher. Teachers can opt to focus on the early Tudor period, Elizabethans or take a broad sweep across the whole period. Isabella can talk about aspects of Tudor life to do with medicine, health, food, leisure time, clothing, beliefs, family roles, houses, religion, occupations, towns, entertainments, and laws. In addition, Isabella can talk about how important folk (Henry VII, Henry VIII, Lady Jane Grey, Elizabeth I, Shakespeare, The Dukes and Earls, The Pope) impacted the lives of ‘ordinary’ folk. If desired, Isabella (or her historian alter-ego) can run workshops with the children in conjunction with the teachers. Or teachers can opt to run these themselves whilst the character works with another group/class. Workshop themes can include: Drop-Spinning, Weaving, Food, Dance, Artefact Analysis, Clothes, Hygiene, Medicine, Shopping and Money.